Talk about the AR15 style rifles chambered in 450 Bushmaster. I picked up a complete upper from Bear Creek Arsenal and put it on a lower I had collecting dust. I put it together and strapped it on my Lead Sled with the laser and bore-sighted it in the garage, Grabbed a box of Hornady FTX250 Blacks and headed to the range. I consider this thing ready to hunt hogs, I rarely have a shot more than 100 yards and should be good to go at 200 if needed. Great results, you got a good barrel there. 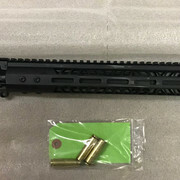 I have found the 450BM to be one caliber that lends to accuracy w/o a whole lot of effort, especially with FTX bullets. Have you had any feed issues? No, currently shooting 16" Bushmaster uppers (2), one with 225-250gr FTX bullets and one with 275gr Barnes pulldowns with no issues. I had some trouble at first but figured out it was mostly the buffer spring I was using. Great to hear. I just got mine that I bought on sale a few weeks ago. Haven't had a chance to try it out yet but hoping I get similar results. Initial inspection seems like a well put together piece. For $238 shipped I figured I couldn't go to wrong for a spare or another starting point on a project. I have to laugh, my main gun, and my favorite, is a dead shot barrel on a Bear Creek side charging upper. I have to think if BC would put their barrels on their side chargers they would have a wildly successful product. All above reference is to 450 Bushmaster Hint hint. Hello new to the forum. Trying to learn as much as I can about the 450Thumper. 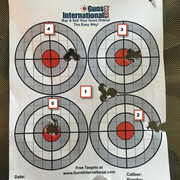 Im glad to see, good accuracy out of BCA uppers. I plan on building a Deer rifle for next years Iowa gun season with BCA's 18" upper, when ever they get restocked. Greymatter wrote: Have you had any feed issues? No feed issues at all. I am using black followers in steel 20 round mags. Good results! I'm ordering 2 18inch uppers from Bearcreek when they come back available.